The other problem is fading to fabrics, so it is sensible to avoid using dark colours that can fade very quickly. It is best to choose light colours that will fade less and in case give a feeling of greater spaciousness in the conservatory. Alternatively, make sure that you install and use conservatory blinds to protect your fabrics. Rattan is a climbing plant found in Indonesia, Malaysia and Thailand and is an excellent material for making furniture, as it is lightweight and flexible. Different diameters of the Rattan cane are used throughout the construction; the frame of the furniture will use larger sections while the surfaces will use smaller diameters. Rattan is used to make seating, dining and coffee tables, footstools, baskets and magazine racks. It can be varnished or painted and will give years of service and since it is lightweight it is easy to move outside into the garden on summer days. Invented in 1907 by Marshall Lloyd, an American with English parents, Lloyd Loom is a woven twisted paper wound round a reinforced steel wire. At the time it revolutionised part of the furniture industry since suddenly a cane looking material could be made that didn’t vary in texture depending on the diameter of the cane. Not only that, but compared to rattan furniture it could be produced in less than a quarter of the time and was therefore cheaper to make and as an additional benefit, more durable. Lloyd Loom furniture was fashionable in the 1920’s and 1930’s; it was used on ocean going liners, and in the Royal Box at the Wimbledon All England Lawn Tennis Club. Like rattan furniture it is available in variety of colours and being lightweight can be moved outdoors on summer days. 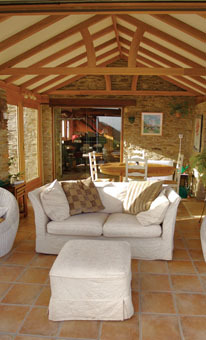 Lloyd Loom conservatory furniture looks great in modern and traditional conservatories.